Hip replacement surgery offers the hope of restored mobility to patients who suffer from deteriorating hip joints. Unfortunately, a negligent hip replacement procedure can leave a patient facing issues such as severe pain, infection, failure of an artificial hip joint, or the need for additional surgeries. These postsurgical damages may be the result of medical malpractice. Surgical procedures for replacing worn-out joints are becoming more common. Replacement hip surgery is one of the most prevalent types of orthopedic surgery. Ongoing stress to the hip joint where the femur attaches to the pelvic bone causes the hip bones to deteriorate. After several decades, the articular cartilage of the hip can wear thin, which will expose ligament to the raw bone of the femoral head. Hip replacement surgery is intended to replace the natural bone in order to allow the hip to regain movement. Orthopedic surgeons are responsible for evaluating the specific condition of each patient as well as understanding the processes required for the specific hip replacement device they implant. Diagnostic errors, or negligent mistakes during hip replacement surgery, can lead to severe pain, injury, or other damages to a patient. At Miller & Wagner, our attorneys investigate damage claims for hip replacement surgery errors and offer a free initial consultation to discuss your case. With offices in Eugene and Portland, our lawyers represent plaintiffs injured by medical negligence throughout Oregon and Southwest Washington. Dislocation after hip replacement surgery occurs when the ball of the hip implant dislocates from the socket. Although dislocation of the hip joint is uncommon, patients are at a higher risk during the first few months following surgery when their joint tissues are still healing. Osteolysis (or bone loss) in the hip can occur as a result of medical negligence during hip replacement surgery. Loss of bone can lead to loosening of the joint and reduced mobility. Surgeons are responsible for thoroughly evaluating their patients before surgery to determine whether they have enough bone density to safely undergo the procedure. 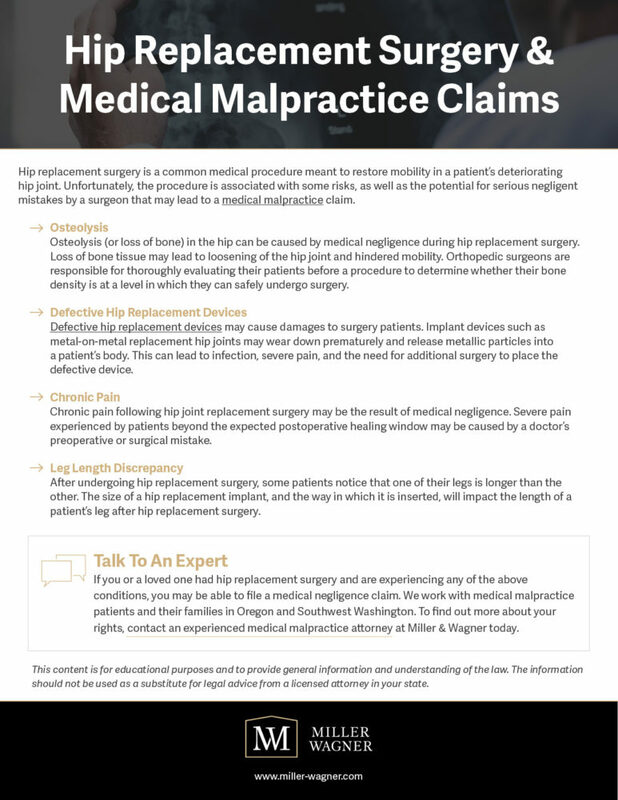 Medical malpractice damages may be caused by defective hip replacement devices, such as metal-on-metal replacement hip joints. Many of these devices wear down prematurely, which can lead to the release of metallic particles into adjoining tissues. This has been known to cause infections, pain, and the potential need for additional surgical procedures to replace a defective device. Chronic or excessive pain after hip replacement surgery can be caused by a number of medical errors and may be a sign of medical malpractice. If you are experiencing chronic pain beyond the expected postoperative healing window, it may have been caused by a mistake during surgery or the preoperative process. After hip replacement surgery, some patients notice one leg may be longer than the other. The size of a hip replacement implant, as well as the way it is inserted, will determine the length of a patient’s leg after surgery. Asymmetry of the legs after hip replacement surgery may be the result of medical negligence. From our offices in Portland, our medical malpractice trial attorneys represent plaintiffs in medical negligence claims against physicians and healthcare providers throughout Oregon and Southwest Washington. For your convenience, we also have a satellite office in Eugene. If you or a family member have suffered from hip problems following hip joint replacement surgery, talk to an attorney on the medical malpractice team at Miller & Wagner. Our lawyers have years of experience investigating and preparing medical negligence cases. We will provide you with an honest evaluation of your case and explain your options for recovering full and fair money damages for your injuries.